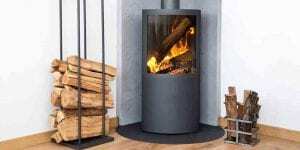 What is a log burning stove? A log burner is a heating appliance proficient in burning wood and biomass fuel, such as wood pellets. Usually the appliance comprises a firm cast iron or steel enclosed fire chamber, a brick base and a changeable air control. Through the combustion of the wood, the wood stove produces hot air to heat the room where it is installed and, depending on the models, also the adjacent rooms (through the corresponding pipes). Read: All you need to possibly know about log burning stoves. Traditional cooker with a stove built in. Logs burnt then produce heat that can be used for cooking. Normally a stove with a back boiler fitted to pump hot water to radiators around a house. Simplistic stoves that just heat the room that they are placed in. A stove that can heat 2 rooms at the same time. These stoves usually have doors each side, so logs can be inserted from both rooms. Double sided stoves normally sit centrally within a fireplace without a dividing wall.